Surface Preparation: The bonding surface must be relatively clean and dry. Contaminated surfaces should be cleaned with a 50/50 Isopropyl Alcohol and water mixture. A clean lint-free cloth should be used. Shake 3M Primer 94 well before using. Apply a thin uniform coating to the bonding surface using the minimum amount that will fully coat the surface. Allow 3M Primer 94 to dry thoroughly before applying tape. This is usually accomplished in 5 minutes at room temperature. Be sure the primed surfacere mains free from contaminants prior to applying the tape. 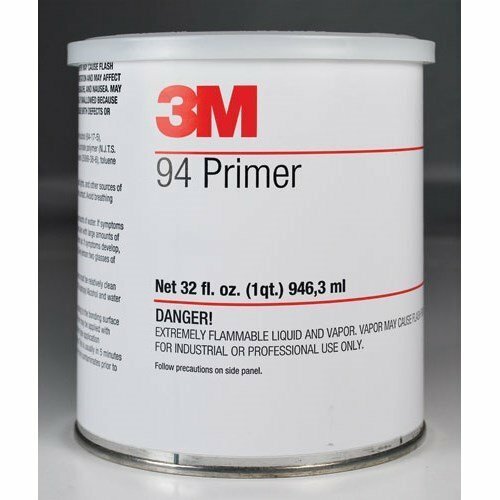 Porous surfaces may require 2 applications of 3M Primer 94 for uniform coverage and good adhesion.Allow first application of primer to dry before applying the second coat. 3M Primer 94 may be applied with brush or swab. It can also be applied with a pressurized flow gun, knurled roller or another similar type of application equipment. Trade MembershipISO certified. D & B certification.